Roasted Cod on Spinach with Feta, Lemon and Dill – quick, easy, delicious and beautiful on the plate. What more could you ask for? Well, it’s healthy, too! I love this dish because it’s naturally healthy and full of fresh flavors. It also only takes around 10 minutes to prepare, then 10 minutes to cook, so you can have dinner on the table in 20 minutes or less. Yay! Great for those super busy weekdays. 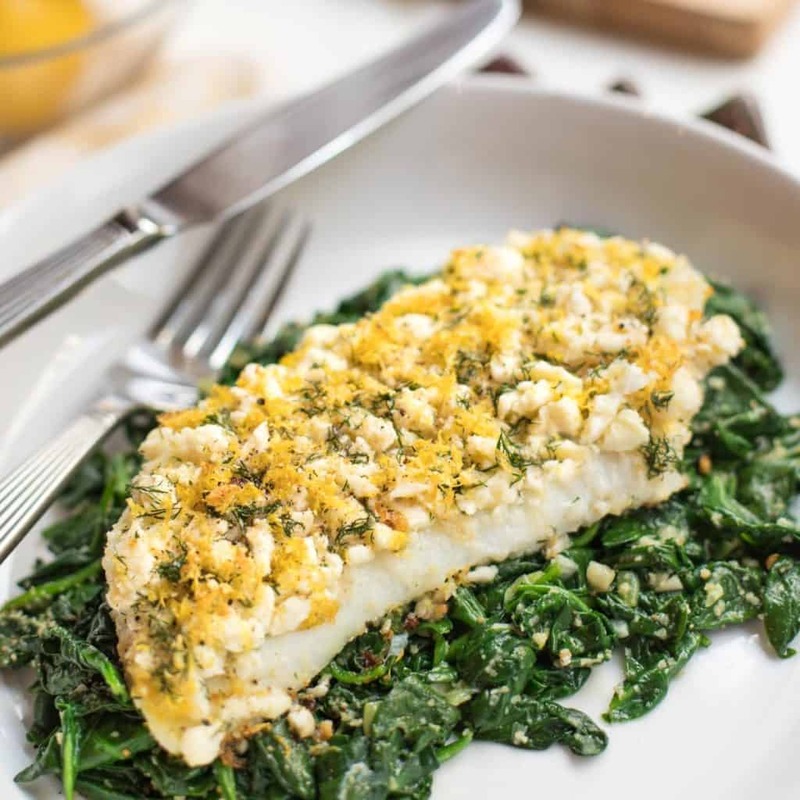 Fresh cod fillets are topped with lemon zest, chopped dill and crumbled feta cheese and then roasted. They are served atop a bed of sautéed garlic-y spinach that is spiked with breadcrumbs and red pepper flakes – to add a bit of crunch and spice. The breadcrumbs also absorb some of the moisture in the spinach, so it doesn’t come out watery. 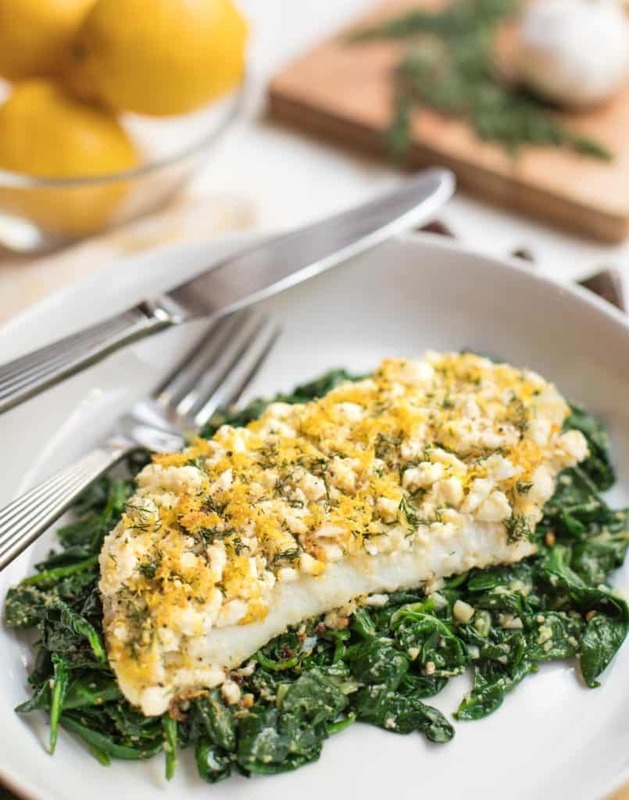 Lemon and dill are excellent complements to almost any fish, and they pair well with both the spinach and cod in this dish. If you aren’t a garlic eater, you can substitute shallots. Serve with brown rice and/or quinoa. Enjoy! 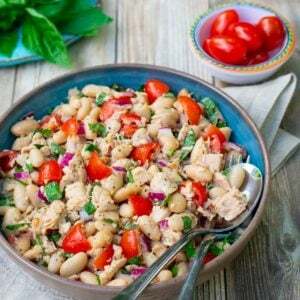 A naturally healthy main dish that is quick and easy to prepare, full of flavor and colorful on the plate. Preheat oven to 425 degrees. 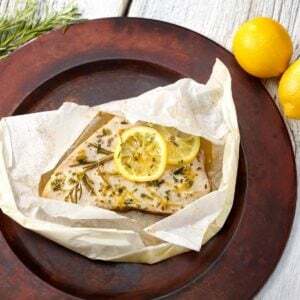 Line a 9 by 12-inch baking dish with parchment paper. Place cod fillet(s) in prepared dish and brush with lemon olive oil. Evenly sprinkle feta cheese, lemon zest and dill on top. Roast in the oven, uncovered, 8 to 10 minutes per 1-inch of thickness (at its thickest point), until opaque and just cooked through. Switch the heat to broil and broil for 2 minutes to melt and lightly brown some of the cheese. Watch carefully so it doesn’t burn! While the fish is cooking, in a large sauté pan or skillet, heat 2 teaspoons regular extra virgin olive oil over medium heat. Add green onions, garlic and around half of the spinach. Cook, stirring, just until the spinach is wilted. Add remaining spinach and continue to cook, stirring, just until wilted. Remove from heat and stir in breadcrumbs and red pepper flakes (if using); season to taste with salt and pepper. Divide cooked spinach among four serving plates. Top with cod fillet. Serve immediately. Gluten free: Use gluten free breadcrumbs. Make ahead: fish can be prepared but not baked earlier in the day, covered and refrigerated. Bring to room temperature before baking. Tip: Check out my tips for buying and storing fresh fish!